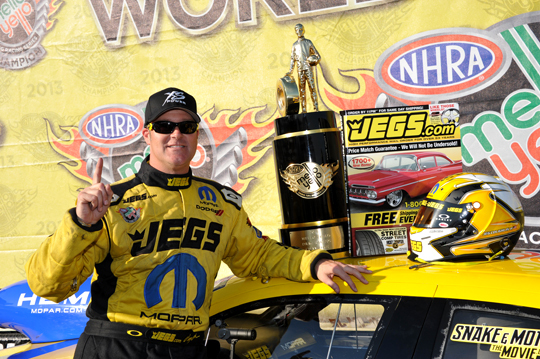 Jeg Coughlin Jr. Wins Fifth Title! their fifth Pro Stock title Sunday in the Auto Club NHRA Finals. JEGS.com/Mopar Dodge driver Jeg Coughlin Jr.won his fifth Pro Stock title Sunday in the Auto Club NHRA Finals, joining John Force, Shawn Langdon and Matt Smith as season champions. Coughlin, a four-time event winner this season in his Dodge Avenger, took the title at historic Auto Club Raceway at Pomona when his only remaining challenger, Jason Line, lost in the second round of eliminations. “In this day and age, it is so tough to win out here,” said Coughlin, from Columbus, Ohio. “We’ve seen a lot of races won and lost by just a few thousands of a second. I think this is one of the tightest, and one of the most intense championships I’ve ever won. This ranks right up there with 2007 when we had the two cuts to the Countdown to One in the first year of our playoffs.” Coughlin is the eighth driver in NHRA history to win five pro series championships. He also won a Super Gas title in the NHRA Lucas Oil Series in 1992.
the points lead in the NHRA Pro-Stock division this past weekend. JEGS.com/Mopar Dodge driver Jeg Coughlin Jr. took command of the Pro Stock points lead with a brilliant performance in winning the Auto-Plus NHRA Nationals on Sunday at Maple Grove Raceway. Coughlin, the four-time Pro Stock champion, won on holeshots in the semi-finals and final, beating J&J Racing teammate Allen Johnson in the finalround with a .004-second reaction time. “Sometimes you live and die on your starts, there’s no question about it,” said Coughlin, who secured his 56th career Pro Stock victory. “We just had some off runs the last two weeks and didn’t get away with it. I think the thing that fired me up is following my son, Jeg III, play in the Ohio state district golf tournament. He was looking to advance to the state finals. It was an event, kind of like the Countdown (to the Championship), where it’s all on the line. A bad hole or two can make it tough. Coughlin’s “worst” reaction time Sunday was .032 seconds, but he also had lights of .022 and .012. The .012 came against No. 1 qualifier Jason Line in the semifinals after Line had lane choice with a quicker pass in the quarterfinals. But thanks to Coughlin’s head start of .029 seconds (Line was .041 on the Christmas Tree); he was able to hold off Line’s pass of 6.607 seconds at 210.01 mph with his slower run of 6.615 seconds at 208.39 mph. Johnson, the No. 2 qualifier who had one of the quickest cars Sunday, had lane choice, too. But Coughlin’s near-perfect reaction time got him ahead, and he won with a pass of 6.616 seconds at 208.75 mph, holding off Johnson’s quicker 6.588 second run at 209.39 mph. The two holeshot wins give Coughlin 91 for his stellar career, the most in Pro Stock history. “It doesn’t get any better than that,” Coughlin said of the semifinals and final. “The KB Racing cars have come on like gangbusters the last four or five weeks. To get by my teammate AJ – he’s gotten by me in a couple of finals this year – it felt nice to see that win light turn on. I put the car in fifth gear and peered over to the right. I could hear him but not see him. Coughlin had led the Pro Stock standings during the previous two races but didn’t hang on to it at the end of each event. This time, though, he assured himself of the points lead by beating Line and then extended it to 45 points, unofficially, by winning the race. The Countdown resumes with the NHRA Nationals on Oct. 25-27 at The Strip at Las Vegas Motor Speedway, the penultimate race of 2013. Fifteen-year old Venturini Motorsport’s driver Kyle Benjamin made history Sunday, becoming the youngest winner in ARCA Racing Series presented by Menards history, winning the 200-lap Herr’s Live Life with Flavor 200. “Winning today is the highlight of my career! We had a top five car at the beginning before making our first and only pit stop. We got that two tires and the car came to life,” Benjamin said. “From there it was smooth sailing. Kevin Reed is such a good crew chief. I got the best team behind me. Billy Venturini is awesome. I had a great spotter. Everything just came together today. I’m really happy for all of the guys.”Benjamin’s victory was the third consecutive victory for Venturini Motorsports (VMS) setting another series record for the most consecutive team/car wins with multiple drivers behind the wheel. Erik Jones and Brennan Poole found victory lane the two previous races (Berlin Raceway & Springfield) both driving the No.15 VMS entry. Furthermore VMS’s No.15 car has now won five times in 2013 all with crew chief Kevin Reed at the controls. Justin Boston finished second at Madison earning a new career best driving his No.25 ZLOOP Computer and Electronics Recycling Toyota. Boston who is battling fellow competitor Mason Mingus (No.32 811 Call Before you Dig Toyota) for ARCA rookie of the year honors now has (6) top-5 and (13) top-10 finishes in 16 of 21 events. Drivers Justin Boston, Brennan Poole, Taylor Ferns and Milka Duno will try to make it four in a row for team VMS this week when the ARCA Racing Series returns to the DuQuoin, Illinois State Fairgrounds and the Magic Mile on Labor Day, Monday, September 2nd.Practice for the Southern Illinois 100 presented by Federated Car Care is scheduled from 9:00-10:00 a.m. with Menards Pole Award Qualifying presented by Ansell following at 11:15. The 60th annual Southern Illinois 100 starts at 1:30 p.m. All times are local. The event will feature live timing and scoring for all on-track activity at ARCAracing.com, as well as live flag-to-flag audio coverage of the race. Venturini Motorsports (VMS), fielding cars for over 30-years in the ARCA Racing Series presented by Menards, is one of the premier NASCAR driver development programs in the country. Multiple team championships and consistent on-track success, VMS has evolved into one of the most recognizable names in motorsports. Since 2007, VMS has assisted in the career development of notable NASCAR drivers such as Joey Logano, Justin Allgaier, Ryan Blaney, Alex Bowman, Brian Scott, Kevin Swindell, Miguel Paludo, John Wes Townley, Josh Richards and Johanna Long. In 2012, VMS and the Venturini family was inducted into the National Italian American Sports Hall of Fame and now find themselves enshrined with such sports icons as Joe DiMaggio, Mario Andretti, Vince Lombardi, Tommy Lasorda and Rocky Marciano, among others. After nearly two decades away from NASCAR, 2013 marks VMS’s modern day return to the series with John Wes Townley driving the team’s familiar No.25 in selective NASCAR Nationwide Series events. XS Power is proud to have a part in powering the Speed Demon crew to the fastest ever piston driven car at the Bonneville Salt Flats! Read more about this record setting car at Hot Rod Magazine! Or you can watch it yourself right here! Venturini Motorsports Going Back to Chicagoland! (CONCORD, N.C. – July 19, 2013) – Venturini Motorsports celebrated its 30th season in the ARCA Racing Series presented by Menards last year with a dominant win at Chicagoland Speedway. Yet again, 30 is the goal. On Sunday, the team will have a chance at defending Victory Lane and earning its 30th ARCA win in a return to the place the Venturini family calls home. Today, two-time ARCA driver champion Bill Venturini and owner champion Cathy Venturini, and son and team general manager Billy Venturini, are the key players in the team’s operation from North Carolina. But the family racing lineage began over 60 years ago in Chicago, when Bill’s father, Tony, raced at Soldier Field. Bill and Cathy formed the team now known as Venturini Motorsports and entered ARCA competition in the early 1980s, and it was only 20 years ago that the family moved to Charlotte to stay ahead in racing. Still, by years, the majority of the Venturini family’s racing history has taken place in and around Chicago, making Sunday’s race as important as any. Kevin Swindell led every lap at the 1.5-mile Joliet, Ill. track last season, establishing a new race speed record of 141.103 mph. In Sunday’s Ansell ActivArmr 150, four Venturini Motorsports drivers will have a chance to join Scott Lagasse (2008) and Swindell as Venturini winners at Chicagoland by scoring a milestone win. Justin Boston, who is fourth in the ARCA Racing Series presented by Menards point standings, will be at the wheel of the Venturinis’ flagship No. 25 car in Sunday’s race, hoping to improve upon an impressive speedway performance at Michigan International Speedway last month. Boston (No. 25 ZLOOP Computer & Electronic Recycling Centers Toyota) led 15 laps before finishing fourth, which tied his career high. Milka Duno (No. 35 CanTV/Milka Way Toyota), the team’s other full-time driver, stands seventh in points, only 110 points from fifth. Duno finished 18th at Chicagoland last year, and will look to improve on an already consistent run which has seen her place between 10th and 13th in each of the last six races this year. Caleb Armstrong (No. 15 Venturini Motorsports Toyota) last raced in ARCA at Talladega in May, finishing a career-high third. Racing just a three-hour drive from his hometown of New Castle, Ind., Armstrong undoubtedly has his eyes on earning his first ARCA win in front of a Midwestern crowd. The local connection is even stronger for A.J. Henriksen (No. 55 Venturini Motorsports Toyota), who calls Elgin, Ill. – located fewer than 60 miles from the track – his hometown. Henriksen’s 90th ARCA start will be his eighth at Chicagoland but first since 2008. He placed seventh in 2001. So as the green flag drops on Sunday’s Ansell ActivArmr 150 to mark the halfway point of ARCA’s 2013 season, Venturini Motorsports has plenty going for it: hometown support, familiar surroundings, and a strong history of recent speed and success. A day in the life of our favorite Baja driver and soon-to-be retired Fire Captain, Cris Cornette. 1. BajaRack rack holds a ton (not literally, but close) of gear inside Zarges cases, plus MaxTrax sand ladders and a locking Hi-Lift mount. 2. Here’s a close-up look at the swingarm of the Demello rear bumper. The diagonal tubes serves as braces for the whole arm, and it easily holds the spare tire and wheel, plus two jerry cans. Note the retaining strap at lower left. 3. Once you discover how great a powered freezer/fridge is, you’ll retire your ice-cooled Igloo forever. A new-generation ARB unit keeps the steaks, eggs and beverages cool in Cris’ truck. 4. Aggressive front end is done courtesy of a rugged Demello Offroad bumper. A Warn winch wrapped in synthetic line sits inside the bumper for recovery duties, and two 6″ HID Soltek fog lights are ready to lead the way on a murky night. 5. An awning from Camping Labs makes for a pleasant space to sit, have a cup of coffee or dinner, or enjoy the last hours of a long, hot day on the trail. 6. Demello Offroad came through with a gorgeous piece of rear bumper fabrication. Built with signature Demello strength, the unit also looks just right on a Tacoma, neither too big nor too small. Dual recovery points and a 2″ hitch add to the utility. Cris sleeps in the back of the Tacoma, so he chose an Outdoorsman bed shell from A.R.E. which has been color-matched white. A 1.5″ rear adda-leaf kit from Icon Vehicle Dynamics keeps the rear end up under added weight. 7. Dual XS Power D5100 AGM batteries are found under the hood in a Columbia Overland battery box and are monitored full time with a custom computer monitored regulator. 8. It’s a major drag—literally–at best and a fatal problem at worst to be stuck and bogged down in the desert. This Tacoma has MaxTrax sand ladders on hand to help give the tires traction and get moving out of the dunes. Look for a test feature on these units in an upcoming issue of 4WD Toyota Owner. Cris Cornette’s 2010 Tacoma is an awesome combination of brains and brawn. Brains because it’s been built strategically and with a vision—for supremely reliable, long range expedition work in the roughest of conditions. Brawn because it’s hard to kick sand in the face of Demello bumpers, BFG KM2 tires, dual batteries, Safari snorkel, Warn winch and more, and not expect to pay a price! Rhino Lining down the sides of the Tacoma keep rock and brush rash at bay, as well as look sharp. Demello rock sliders keep the door sills healthy when under rock attack. That’s an A.R.E. rear shell, by the way, complete with roof rails to hold the BajaRack and gear. 4.88 gearing and a rear ARB Air Locker also help with traction in tough terrain. Do you like the steel wheel look? Wake up and do it all over again! XS Power Wins at Daytona Again!! Venturini Motorsports driver John Wes Townley took the checkered flag Saturday after an amazing sequence of events inside the final 10 laps left him at the front of the Lucas Oil 200 presented by MAVTV American Real. Townley won from the pole in what was the 50th annual ARCA Racing Series event at Daytona International Speedway. “It’s one thing to win your first race in ARCA, it’s another to win at Daytona,” Townley said after the first win in the 31-year history of Venturini Motorsports at Daytona International Speedway. The new XS Power D4700, D4800, and D4900 are direct fit batteries for many of the most popular European model vehicles including Mercedes, Jaguar, Land Rover, Porsche, SAAB, Rolls Royce, Volvo, and more. These batteries are designed for use under the hoods as starting batteries or in the back as secondary batteries. The D4700 and D4800 are good for up to 2000 watts as the starting battery and 3000 watts as a secondary battery. The D4900 will power up to 3000 watts as the starting battery and 4000 watts as a secondary battery. XS Power is proud to be powering Jimmy Owens “The Newport Nightmare” again for the 2013 season. Jimmy is the 2011 & 2012 Lucas Oil Late Model Dirt Series National Champion and one of the favorites at any track he goes to! 2013 could make Jimmy Mr. 3 Time! “Since switching over to XS Batteries in 2012 we’ve had a ZERO failure rate with our batteries. The durability and power XS provides our cars gives us the comfort of knowing we have what it takes to compete without mechanical failure and is just what we need to continue winning”, added Bill Venturini. XS Power experienced a tremendous 2012 season with multiple wins and records in NASCAR, ARCA, NHRA, ADRL, IHRA, World of Outlaws, SCCA, and more with the full line of 12V, 14V, and 16V batteries. If it had wheels, raced, and needed power XS Power experienced success in it in 2012. We would like to thank you all for a great 2012 and invite you to stop by the PRI booth (2163) to talk about 2012 and look forward to raising the bar in 2013. Come by the XS Power Mobile Booth (11783) or Performance Booth (23417) to check out the new products for 2013. Ally will be in the booth signing posters, so make sure to come by and say hello. Make sure and check out our Facebook and Twitter pages to get update from the show. We will be posting up new products and some of the baddest builds being displayed at SEMA! Going into the final two races of the NHRA Pro Stock season 2 out of 3 top drivers in the points standings put their trust in XS Power Batteries to power them to the Championship. With 9 wins this season XS Power has had a great season so far, and there is still some room for a few more trophies to be put on the shelf this season. Best of luck to all the teams and drivers going into the final two races of the year! XS Power’s biggest 12V battery yet debuting at SEMA 2012 Booth 23417! More power is always good! Check back for more info coming soon. 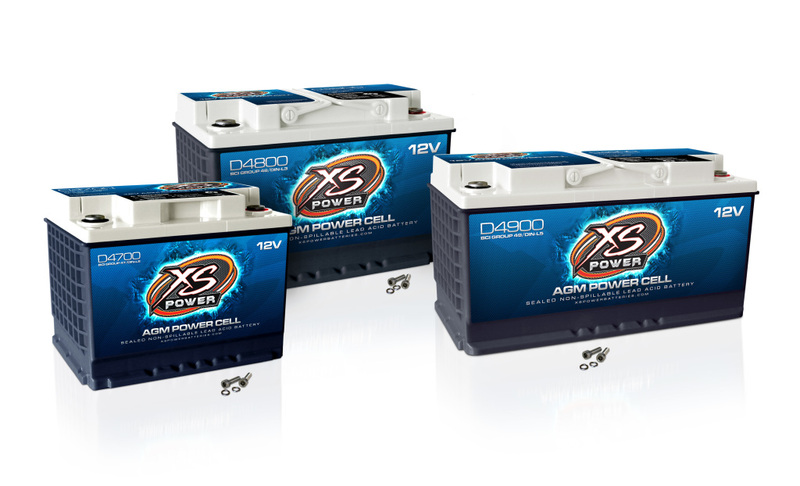 XS Power introduces three new popular direct fit European batteries to the D Series lineup. The D4700, D4800, and D4900 will be available for order at the November 2012 SEMA Show in Las Vegas, NV. XS Power has added three new models to the D Series lineup for starting and secondary power demands. The D4700, D4800, and D4900 are direct fit replacement batteries for many Aston Martin, Audi, BMW, Mercedes-Bens, GM, Jaguar, and other model vehicles. Adding these batteries to the line expands XS Power’s direct replacement options to include many of today’s most popular customized vehicles. The D4700 is a BCI Group 47 battery commonly referred to as the L2, which is a small size battery that fits many small sedans. It’s capable of 2,900 Max Amps, and BCI rated at 745 CA. The D4800 is a BCI Group 48 battery known as the L3, which is common for mid-size sedans and SUV’s. It is designed to produce over 3,000 Max Amps and is BCI rated at 815 CA. The D4900 is a BCI Group 49 battery referred to as the L5 that is direct fit for many larger luxury sedans and SUV’s with excessive electronic systems. This battery is capable of 4,000 Max Amps and is BCI rated at 1075 CA. All three of these new batteries, along with the other new products for 2013, will be available at SEMA 2012 in the XS Power Mobile Audio booth (11783). Make sure to come by to see all the new products and take advantage of the SEMA Show specials offered to all of our dealers and distributors. Dave Connoly and Cagnazzi Racing did a little testing at Rockingham in their new COPO Camaro. Check them out at the 2012 US Nationals. Erica Enders stormed to her second consecutive Pro Stock victory, and third of her increasingly stellar season, by winning the Lucas Oil NHRA Nationals at Brainerd International Raceway on Sunday.That follows her historic victory in Chicago on July 1, when she became the first woman to win in the ultra-competitive Pro Stock class, and her win in Seattle on Aug. 5 when she and Courtney Force became the first duo of women to win the same national event. Plus, Sunday’s victory was a first in an NHRA national event at Brainerd for a woman since legendary Shirley Muldowney won here in Top Fuel in 1986. Enders has now won three of the last six Pro Stock races, firmly placing her name among the contenders for the 2012 championship. Her GK Motorsports team, led by car owner Victor Cagnazzi and crew chiefs Dave Connolly and Tommy Utt, has worked to improve the performance of Enders’ Chevrolet Cobalt in recent months. Enders’ recent streak – which also includes track elapsed-time records in Sonoma and Brainerd – is proof of the hard work. XS Power is Proud to be a sponsor of Erica Enders and Caganazzi Motorsports. Erica Enders took homer her second Wally of the year in a dominating fashion Sunday in Seattle. Erica drove the GK Motorsports Chevy Cobra past three of the best en route to her win. She took out Greg Anderson in the quarterfinals, Allen Johnson in the semifinals, and the reigning Pro Stock world champion Jason Line in the final round to bring home another victory for Cagnazzi Motorsports. With the win, Enders clinched her spot in the Countdown to the Championship, NHRA’s playoffs that start in Charlotte, Sept. 14-16. For the first time in NHRA Full Throttle Drag Racing Series history, two female drivers claimed Wally trophies at the same event. Courtney Force powered her Traxxas Ford Mustang Funny Car to the winner’s circle for the first time in her career, and Erica Enders earned her second career Pro Stock victory in her GK Racing Chevy Cobalt at the O’Reilly Auto Parts NHRA Northwest Nationals presented by Super Start Batteries at Pacific Raceways. Swindell, the son of Sprint Car racing icon Sammy Swindell, earned his second career Pole position and his first ARCA Racing Series presented by Menards victory of his young career. At 23-years old, Swindell is no stranger to the spotlight as he’s gained national recognition as a three-time and defending champion at the famed Chili Bowl Midget Nationals in Tulsa, Oklahoma. XS Power is proud to power and sponsor Venturini Motorsports! What odds would you give an underfunded NASCAR race team with a beaten and battered race car on the high banking super speedway of f Daytona? Not very good right? Well take that same team, car and race track, but add in the heart and passion of a champion and the odds increase significantly. They actually go up all the way to Victory Lane! Kurt Busch drove the Phoenix Racing Chevy to the win Friday night in the Subway Jalapeno 250 at Daytona. XS Power is proud to be a sponsor of Kurt Busch and Phoenix Racing. XS Power in the History Books! Erica Enders and Cagnazzi Racing had been to the final round 6 times in the past and had come up a little short each time. Erica made her first ever Pro Stock finals in 2005 at Chicago, and going into this weekend at Chicago the team felt they had a good shot of making it back to the final round. Well Sunday in Chicago Enders made it to the final round and ran a 6.627 seconds at 207.40 mph to beat Greg Anderson and take home her first ever Pro Stock Wally. Enders became the first female ever to win in the NHRA Pro Stock division. “”It’s awesome,” said Enders, the 12th female winner in an NHRA pro category race. “I think that if I could have planned it I would have asked to run Greg in the final. You know that he made it very clear that he didn’t want to lose to me. He’s a very competitive guy and I love him to death, but I couldn’t wait to beat him. I’m glad (the win) came here in Chicago. I had my first final in Pro Stock here in 2005, and so it was nice to circle back around and get it done here. XS Power is proud to be a sponsor of Erica Enders and Cagnazzi Racing! Kurt Busch and the Phoenix Racing #51 Chevrolet head to Sonoma, CA this weekend. 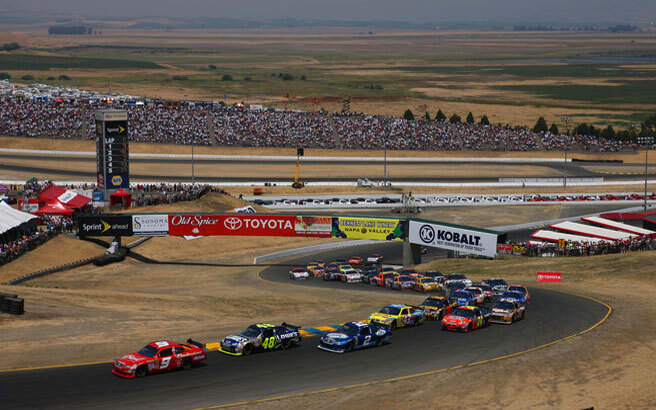 In 2011 Kurt lead the most laps and went on to win in Sonoma for his first road course win. Heading to the west coast may just be what the team needs right now. The #51 Chevy was very fast in practice and qualifying at Michigan, but a loose race car got him into to trouble early and made for a very long day for the team. Kurt has 4 Top 5 finishes and 4 Top 10 finishes along with one win at Sonoma. Venturini Motorsports showed just how dominate of a team they are at the newly paved Pocono Raceway this past weekend. Brennan Poole dominated the entire race with his #25 Venturini Motorsports Toyota and picked up the maximum points possible to extend his lead at the top of the points standings.Poole started off the weekend by setting a blistering qualifying run which set a new qualifying record on Friday, breaking Kyle Busch’s 2003 mark with a fast lap of 173.554 mph. Poole won the pole by nearly a quarter of a second over teammate Kevin Swindell (No. 55 Curb Records/Venturini Motorsports Toyota). Poole started from the pole and went on to lead 77 of the 80 laps. Swindell also had a very fast car and passed more cars than any other driver on the track, but a front left tire issue plagued him all day. Poole’s victory puts him unofficially leading the points by 60 points in the ARCA series. Venturini Motorsports and the ARCA series presented by Menards are heading to the Michigan International Speedway for the RainEater Wiper Blades 200, which will air live on SPEED Friday at 5:00pm. (ELKO NEW MARKET, Minn.) – Brennan Poole passed Frank Kimmel for the lead in the Akona 200 presented by Federated Car Care on Lap 134 of 200 and did not relent, winning his second race in the ARCA Racing Series presented by Menards. Poole (No. 25 Venturini Motorsports Chevrolet) led 148 laps in all after first taking the lead from Matt Lofton (No. 16 Strutmasters.com Chevrolet) on Lap 12 and leading until the caution flag was out on Lap 92, then ultimately running first for the final 67 laps. Matt Lofton finished second over Chris Buescher (No. 17 BeavEx/Reliance Tool Ford), and they were followed by Kimmel (No. 44 Ansell/Menards Toyota) and Tom Hessert (No. 52 Federated Auto Parts Chevrolet). “The car was really good,” said Poole, whose last win came in his series debut last spring at Salem Speedway in Indiana. “I can’t thank Venturini Motorsports enough. It’s pretty awesome to win the inaugural race at Elko. I had a lot of fun here tonight. The track’s a blast. Of course, it’s always fun when you’ve got such a good race car. I was slipping and sliding and trying to get everything out of it coming into the corner, dodging traffic. It was crazy. The race was the first for ARCA at Elko Speedway, just south of Minneapolis and St. Paul. ARCA’s top division had never before appeared in Minnesota. Poole had shown his dominance early in the race, pulling away to leads of over three seconds on second place and more than 10 seconds on third. When Poole drove away, he truly got away from the field. Often, he would cross the start/finish line when someone as high as third place was just exiting Turn 2 on the 0.375-mile oval. His final margin of victory was 1.205 second, perhaps a conservative margin. “The car was really good out front and it worked really well in traffic,” said the 21-year-old from The Woodlands, Texas. “We were just a little bit tight, so we had to save the right front once we got into the lead. I kind of used up what I had to get into the lead so once I got there, I just tried to let it ride and protect that right front. That first run, I was good up front, but I used up my right front tire and started to get tight late in the run. Alex Bowman (No. 22 St. Jude Children’s Research Hospital Dodge) won the Menards Pole Award presented by Ansell for the third time in six races this season, but could only hold the lead for eight laps before being passed by Lofton. Poole opened up a quarter-second lead at Lap 12 and extended it to more than three seconds by Lap 42. His lead over Lofton had fallen off to less than two seconds when a car spun on Lap 67 to bring out the race’s first caution. While Kimmel, Buescher, Bowman, Lofton, and other contenders elected to pit, Poole stayed out and got away clean at the Lap 76 restart. Kimmel, driving on fresh tires, rose to third by Lap 86 and second over Hessert on Lap 89, but Poole still led by more than a second. Another spin on Lap 91 brought out the race’s second caution flag, causing Poole to pit. Kimmel took the lead under the yellow flag on Lap 93, driving ahead of Lofton, Buescher, Poole, and Ryan Reed. He led out of the Lap 97 restart, and stayed there through two more caution periods, which concluded with green flags on Laps 117 and 123. The Lap 123 restart would prove to be the race’s last, and Kimmel led a two-by-two pack as cars moved back to speed. On his outside was Buescher, and the two were trailed by Lofton on the inside and Poole on the outside, in fourth. Kimmel originally got away and the group became a single line six laps later, but Poole moved inside Lofton for third on Lap 130. Three laps later, he passed Buescher on the backstretch, and one lap later he took the lead from Kimmel in the same place. Buescher moved past Kimmel for second, but Kimmel eventually regained the spot. Side-by-side traffic throughout the race’s late stages allowed Poole to get away. Hessert climbed to fourth in the final laps and had a look at third place. Larry Barford Jr., driving several laps down, drove into Hessert and Buescher as they all drove to the checkered flag, setting off some personal fireworks between Hessert and Barford as Poole coasted to a final victory margin of 1.205 seconds. He now leads Hessert by 10 points in the unofficial series standings. Joey Miller, making his first ARCA start since last August, finished sixth at his home track; Miller is from Lakeville, Minn., and was looking for his sixth ARCA win after leading the first practice. Chad Hackenbracht, who won a national legends championship at Elko in 2008, finished seventh. Erik Jones, Mason Mingus, and Jared Marks filled out the top 10. From the green flag to the checkered flag, the race last just 44 seconds over an hour, a 74.09 mph pace. Four caution flags slowed the field for 26 laps. The ARCA Racing Series presented by Menards will visit Pocono Raceway for the first of two events this season next Saturday, June 9. SPEED will air the race at 2:30 p.m. on a same-day delay, one of 10 broadcasts for the series on the network this season. ARCARacing.com will feature live timing and scoring of all on-track events Friday and Saturday. XS Power Batteries launches their New Site. Make sure to check out the new features like the dealer locator, application guide, XS Power merchandise, and more. There are more updates and new features to come, so make sure and check back often. XS Power Batteries’ upcoming 2012 event schedule! Be sure to check back for additions to this years schedule. Truckshow.org is pleased to announce their 9th annual two day automotive and musical extravaganza. Slamology is a different kind of automotive event created for enthusiasts, spectators, media groups, custom automotive shops, distributors, and manufacturers alike. Slamology works at creating a bond of all entities involved in the automotive industry, as well as giving the community a look into the heavily populated and ever growing sport of customizing vehicles. They have a full weekend planned with plenty of entertainment for the auto and music enthusiast in you. How long have you been modeling? Since the age of 13 years old, but professional modeling approx. 2 1/2 years. Biggest highlight in your modeling career? When I was introduced with Metal Mulisha and Rockstar Energy Drink to be used as one of their models and maidens and of course XS Power! What traits do you like most about yourself? My eyes and legs. What do you do for fun? Work out and train hard, beach, do things to my car, starting to go fishing again, and I’m wanting to start riding motorcross bikes! Hells yeah! What do you wear to bed? Tank top and boy shorts. Do you have any upcoming projects or events you have planned where your fans can meet you? Usually just come unexpected, but I will most likely be in Tampa sometime in August with Metal Mulisha for the Mayhem Festival and I’m also training for my first bikini fitness competition that is approx. about 12-14 weeks away that will be in St. Augustine or Tampa (not sure which show yet). Getting SBN 2012 started right! A great competitor and a great guy!! We will miss seeing him in the lanes, but we will enjoy getting to have him in the booths and spending more time having fun at the shows!! !